Awesome Friday! » Blog Archive 66th Primetime Emmys: Water Cooler Edition - Sofia Vergara Rotating on a Pedestal - Awesome Friday! The 66th Primetime Emmy Awards were held on a Monday and a month earlier this year to accommodate both the VMAs and NFL season. But it’s okay, you’ve seen this show before. No, really. 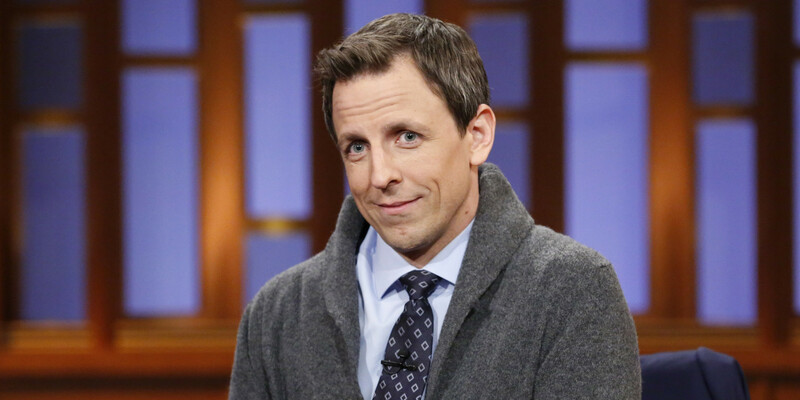 Seth Meyers gave a fantastic monologue but beyond that it was pretty much a lot of the same as last year and the year before. I was so bored that I couldn’t even muster up annoyance at the fact that the President of TV (as Stephen Colbert called him) literally put Sofia Vergara onto a rotating pedestal so that people would have something to look at while he spoke. It’s not the Emmys’ fault. It’s a 2 hour (and absolutely no longer!) show that has to give out the most amount of awards. They keep that thing running at quite a clip. Normally that would be a great thing, but despite having a bunch of brand new shows and actors nominated the same people won. In the Comedy categories we had Ty Burrell, Louis CK, Julia Louis-Dreyfus, Jim Parsons & Modern Family. The only surprise was Allison Janney winning for Mom because I literally don’t know anyone who’s actually seen Mom. For the Drama categories it was another Susan Lucci year for Jon Hamm as he watched Breaking Bad walk away with best supporting actor & actress, lead actor, writer and series. The only thing it didn’t win was directing which went to Cary Fukunaga (True Detective), who accepted with a chill attitude and french braided pig tails which fit right in with all the stoner jokes that were being thrown McWoody’s way. The only surprise of the evening was that Sherlock won in the Miniseries/Movie categories for Benedict Cumberbatch, Martin Freeman and Steven Moffat. Even more surprising was when I realized it was submitted in the “movie” category. Supporting & Lead Actresses went to Kathy Bates and Jessica Lange for American Horror Story: Coven. Best Miniseries was Fargo and best movie was The Normal Heart. Weird Al did a theme song parody for some reason that did not work. Amy Poehler and Seth Meyers did a bit that was good to introduce McWoody. Ricky Gervais did his usual “I’m bitter about not winning” funniness. Colbert won for Variety Show and Jimmy Fallon went up to jokingly accept the award, Colbert not missing a beat whispered his thanks into Jimmy’s ear and managed to make him swear on live television. But if there is any part of the Emmys that you watch this year it should be the In Memoriam section. Television lost a lot of amazing people this year. Billy Crystal came out and gave a loving speech about Robin Williams. It was clearly painful for him, but he helped the world grieve the loss of such a brilliant man. There wasn’t a dry eye in the house.